Technology: one of the necessary "evils" of life (note the quote marks, which means I don't really think it's evil, okay, I mean, you know; a precedent has been set, right?). Today's journey through techlandia was this. I woke up and did my morning routine of check work email, check personal email, check text messages, go to the computer and check the overnightly news and FB posts about such news and things my friends are doing. Upon waking the computer, I was greeted with the 'need login verification blah blah blah" - yes, I know. I put in the password. Nothing. Thought I typed it wrong, did it again while sipping the dregs of yesterday's coffee. No response. Nothing. I tried to erase the password it thought it was and couldn't. To cut the story short - no response from keyboard, which was fine before I went to bed. Absolutely fine. And it's one of those ergonomic keyboards (love it!). Plugged it into different USB ports; nothing. Checked that another device and USB cord were working and plugged them into the original USB port for the keyboard. Fine; worked as it should; no problem. Found my backup ergonomic keyboard and plugged it in. No response. Tried different ports. No response. 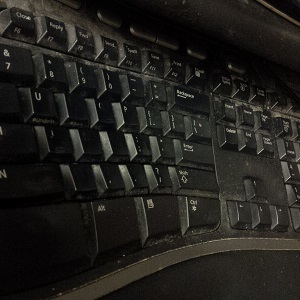 Retrieved the new-in-box-never-used keyboard (style I don't like, flat, narrower, shiver) - same thing. No response. Yes, I tried restart my computer. Voila - a message that there was a keyboard malfunction. Sigh. Searched online on a device. Told to restart computer and then press F2. Um, I can't, the keyboard doesn't respond. 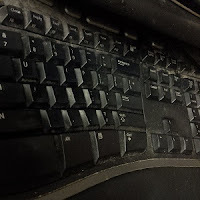 Another helpful person had replied with press F8 with restart - again, malfunctioning keyboard. Had to abandon the project for appointments and tonight a rehearsal. I had managed to get to the point before I left in the control panel where there was some potentially useful information. However, I couldn't start it -- I do know enough to not start a potentially hours long troubleshooting and repair event when I have to leave the house in 20 minutes. So I didn't. Off to appointments, dinner, rehearsal. Home ten hours later. Changed into comfy pants and a super soft t-shirt, made a greens & berries smoothie, filled up my water and I'm ready to attack the computer keyboard problem. Devices ready because I had a plan. Use devices to search internet for more potential issues. Email search results, URLs, etc so I could copy paste from email on my computer (luckily I was still logged in to my email account!) and, hopefully, resolve it quickly. Computer still showing no keyboarding device. I decided to try, one more time, to click the Microsoft "search for device" before proceeding with what was looking like it was going to be a very long night; the keyboard was not responding. This time, it took. Whatever it was, the problem is resolved. Whatever it was, leaving it alone, taking care of other responsibilities and knowing that this was low on my priority list, was the right thing to do. No reason. Nothing changed. Other than time and space for the computer and keyboard to think about what they had done and change their behavior. Sure, right. First world problem, I realize. Problem of privilege, I also realize. And, today, it was one thing I could do right, not related to politics or the state of the country, the world. One thing I can look at and know that I made the right decision this time.